Valentine’s Day is today! I have always loved to make festive, fun foods and treats for holidays but have found it difficult to find healthy options, especially for a day like Valentine’s Day (when chocolate, candy, and frosted cookies fill the store shelves and kids’ bellies)! As an elementary teacher I’ve found it hard to plan class celebrations without bringing in a ton of sugary treats. Kids LOVE decorating cookies and munching on the conversation hearts gifted to them by friends, and that is what they expect at a Valentine’s party. It can be hard to bring in the festive feeling of the holiday while still making health a priority. Now that my son or daughter will be joining us soon (maybe even on Valentine’s day!) I am thinking ahead to the ways I can make holidays like Valentine’s Day special while still providing healthy, nutritious foods. So whether you’re a teacher planning a class Valentine’s party or a mom hoping to make some special treats for your family, here are a few ideas I found that I wanted to share with you. Heart Shaped French Toast: cut your bread out with a heart cookie cutter and then proceed with making french toast. Make it with whole wheat bread and add fresh berries with a little powdered sugar for a healthy option! Heart shaped whole wheat pancakes: Use a metal heart cookie cutter and pour pancake batter inside. Toast Made with Love: Cut whole grain toast into a heart with a cookie cutter and spread with red jam. Cheese and Crackers: Low-fat cheese can be cut using a heart shaped cookie cutter and paired with crackers or fruit. Just 2 ounces of cheese equals one serving of calcium. Use whole wheat crackers for a punch of fiber. Strawberry and Cream Cheese Sandwiches: These tasty sandwiches can be cut into heart shapes using a cookie cutter. Two tablespoons of cream cheese provide a full serving of calcium and the strawberries are packed with Vitamin C. Your kids will love the heart-shaped surprise when they open their lunch box. 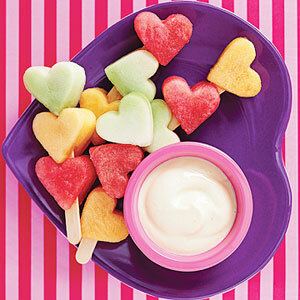 Fruit Heart Kabobs: Use a small heart cookie cutter to cut fruit, and spear with a popsicle stick. Serve with a healthy dip or eat them on your own for a sweet and healthy treat! These are just a handful of great, healthy ideas for your family on Valentine’s Day! Enjoy! Fall 2013 Enrollment Now Open! 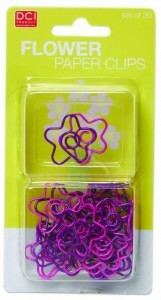 We are very much “details” girls and when we saw these cute flower paperclips we couldn’t resist! Our Fall 2013 enrollment packet and forms are now finalized and ready to be downloaded from the enrollment tab of the website or, if you would like us to mail you a hard copy of the forms (with a cute flower paperclip!) we are ready to do that as well! Either way, please check out the website and the new enrollment tab and you can download the enrollment packet (It has lots of information about The Garden Preschool, including our tuition schedule and program offerings) and then you can either print off the enrollment forms yourself or contact us to have them mailed out to you or to request more information. But, they have to be cute and have a clever pun on them…right? Last year, I made shovel Valentine’s with the “I Dig You” message and they were really cute. I love being crafty and putting together things like this, but my husband was totally right. Logan can make his own Valentine’s and they will mean a lot more if he does the “work” instead of Mommy handing him a bag to give to his teachers to pass out. 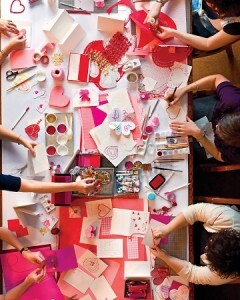 I found this idea to have a Valentine’s “crafternoon” and I think this is great! I love the simplicity of it and I love the freedom and exploration that it allows the kids to have in expressing their love for others. I think I am going to cut out some hearts, get some foam and regular stickers, put out the crayons and stamps and let him go to town. After the cards are created we will sit down together and decide what we want to say on our cards. We will talk about why we love other people and put something meaningful to Logan on each one. I was fully prepared to pump this blog post full of cute Pinterest “punny” Valentine’s but I know that letting him learn and explore will be most meaningful this year! Inch By Inch: We’re going to make this Garden Grow! Wow! The first month in 2013 has flown by! I hope that some of our tips have inspired you to make the most of the precious time you have with your preschooler. I know with getting back to work and school and life, I constantly have to remind myself to pause and really savor my family time. We at the Garden preschool have had a great time reflecting on our own values and building up the foundation for what we hope will enrich the lives of all of the students and families that we get the delight of serving come September when we officially launch the preschool. As we move into February we are going to continue posting on our blog some tips and resources to help make parenting and teaching your preschool a bit easier. All of the posts that you see are on topics that we feel very strongly about and also connect directly to our 3 main value areas at The Garden Preschool: developing a love for God, a love for self, and a love for learning. To develop a love for God we will be posting bible stories, preschool-appropriate “mini-lessons”, crafts, songs, and other faith-building resources that we will also be implementing in our preschool classes. A love for self comes from having the security of knowing that God loves you, but also we will be posting resources ever month for healthy recipes, exercise and “active-time” ideas, and body/self image building books, activities, and tips. Of course as preschool teachers (as well as Mommies) we hope that all children not only learn and grow every day, but also develop a true love for learning and a curiosity that will make the process fun and engaging for them. We will be posting monthly author spotlights, literacy activities, and authentic math and science ideas appropriate for the preschool age. Again, all of the posts will directly relate to our core values at The Garden Preschool and should give you some insight into what your child would be doing if they get to be one of our little learners! Please don’t forget to ‘Like’ us on Facebook so that you will see all of the blog posts come through and also check out our website for information on our Fall programs and contact us if you would like to be in the loop about September 2013 (or beyond) openings. We feel so blessed to be able to bring our passions to all of you amazing parents and we hope that you have benefitted from some of our tips thus far!